VJ Books Features Author Jack Anderson! Jack Anderson was born in Long Beach, California in 1922, but grew up in Salt Lake City, Utah. His writing career began at age 12, when he started editing the Boy Scout page of a church-owned newspaper called The Deseret News. Next, he began covering accidents and fires for The Murray Eagle, a local newspaper, using his bicycle to get to the site these incidents. He also edited his high school's paper. By 18, Anderson was reporting for The Salt Lake City Tribune. He spent two years as a Mormon missionary after high school, and infiltrated polygamous Mormon fundamentalist sects as a reporter. He later joined the merchant marine. He served in China during World War II, and worked afterwards as a war reporter for a time. Anderson met his wife, Oliva, at church and they had nine children together. He was hired by Drew Pearson to work on his Washington column "Merry-Go-Round", which he later took over with a new name. Anderson's column was published in over a thousand papers, with around 40 million readers. Anderson won the 1972 Pulitzer Prize for National Reporting for his investigation on secret American policy decision-making between the United States and Pakistan during the Indo-Pakistani War of 1971. Anderson distanced himself from politicians and showed little favoritism towards his friends when it came to reporting. His tactics included eavesdropping, threats, making off with classified documents, and digging through J. Edgar Hoover's garbage. He made it his mission to keep the government honest, and he made many enemies in the process. During the Nixon administration, he was even the target of an assassination plot by senior white house staff (who were later arrested during the Watergate scandal). 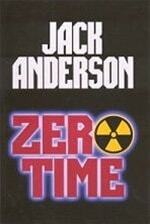 Anderson is also several novels as well as his non-fiction works. In addition, he had a national radio show on the Mutual Broadcasting System, acted as Washington bureau chief of Parade magazine, and was a commentator on ABC-TV's Good Morning America for nine years. He died in 2005 of complications of Parkinson's disease. Author Signed Hardcover Book 1993 NY: Kensington Publishing Co. First edition, first printing, mint, new/unread in a flawless dust jacket, signed by the author. Each dust jacket is protected in an acid-free archival quality acetate cover. 1990 NY: Kensington First edition, first printing, new/unread in flawless dust jacket.